You’re not clever enough to fool Facebook. Asking users to “Like this post!”, sharing the same link or photo over and over, or bait-and-switching people with links to ad-filled sites will now get your Page’s reach in News Feed destroyed, the company said today. Share unique, interesting content and you’ll be fine. Last week I wrote a deep guide to why Facebook’s Page reach is naturally declining and how News Feed works. The tl;dr is that there are more and more Pages and friends competing for the finite amount of time people spend reading the feed. Increasing competition plus limited attention equals decreasing reach. The way to keep your own reach up is to share posts that are widely Liked, commented on, shared, and clicked. 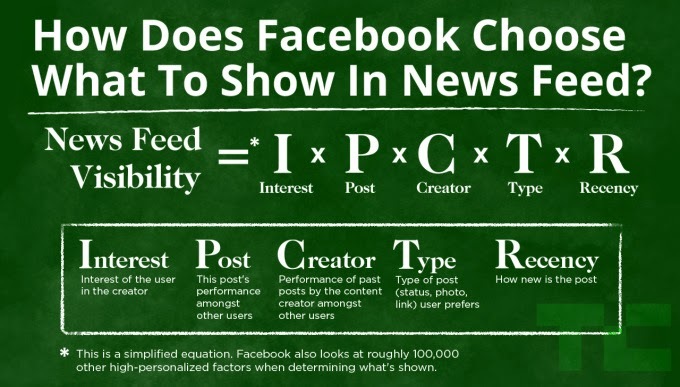 Those signals tell Facebook’s News Feed algorithm that your posts are worth showing to more people. Here’s a simplified equation for how the feed picks what to show. 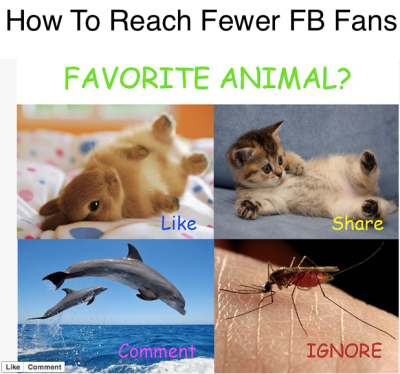 It features the top five factors Facebook looks at, but there are a hundred thousand others. Don’t share the same content repeatedly. Yes, it might be important to you, but your fans don’t want to see it in their feeds multiple times. If you need to share the same link, do it with a different description or photo each time. Don’t say a link leads to one thing when it really goes somewhere else. AKA don’t say “check out our photo gallery” and instead link them to an ecommerce purchase page or site with nothing but ads. Facebook will likely see that users start browsing their feed again a half-second after clicking your link because what was on the other side was a scam, and beat you up for it. Facebook cares about Pages and businesses, but it cares more about people enjoying the News Feed for years to come. Make the feed worse and you won’t show up there any more.